Doug Ford's Ontario PCs would win an election held today. Follow the Ontario Poll Tracker to stay up to date on his chances of winning on June 7. If the election were being held today, Doug Ford and the Progressive Conservatives very likely would form the next government of Ontario. But the election will not be held today. It'll happen on June 7 — and between now and then, the Ontario Poll Tracker will follow the trends in public opinion as voters in Ontario decide who they will place at the helm of the country's most populous province. The new Ontario Poll Tracker is an aggregation of all publicly released polls — an average that is weighted by a poll's date (newer ones are given more weight) and sample size (bigger ones are given more weight), and by the pollster's track record (better ones are given more weight). Aggregating polls has the benefit of following the overall trend rather than focusing on the differences between one poll and the next — differences that often can be chalked up to methodology and margins of error, rather than any specific event in a campaign or an actual shift in public opinion. But when many polls are saying the same thing, it makes it easier to discern the overall trend. And currently, that trend appears to be in the PCs' favour. According to the Poll Tracker, the Ontario PCs currently stand at 42.1 per cent support, putting them well ahead of their rivals. Kathleen Wynne's Liberals trail with 27.2 per cent, followed by the New Democrats at 23.4 per cent and the Greens at 5.7 per cent. The Tories have been leading in the polls since early 2015. They have been given the edge in 18 consecutive surveys and in 47 of the last 49 polls published in the province. The only survey conducted since the release of Finance Minister Charles Sousa's budget, however, suggests that the PCs' advantage may have slipped a bit. The poll by Forum Research gave the Tories 36 per cent support, with the Liberals at 29 per cent and the NDP at 26 per cent. 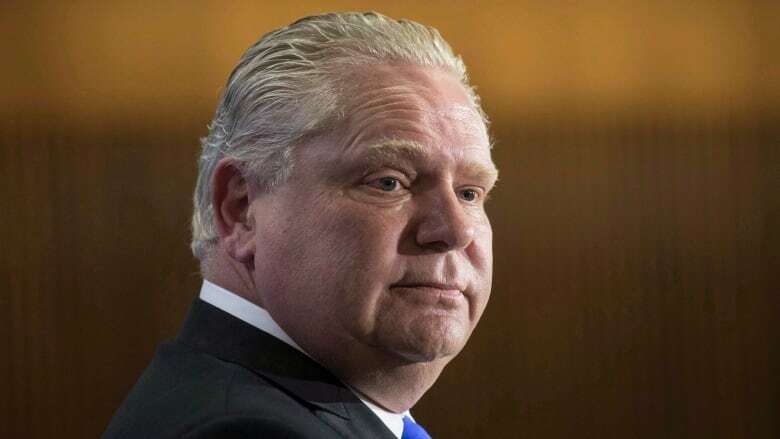 That represented an eight-point drop for the PCs from Forum's pre-budget polling and a gain of six points for the Liberals. This was an especially notable result from a polling firm that consistently has shown higher results for the Tories than other pollsters — but the sample of decided voters was relatively small, giving the survey a wider margin of error and reducing the significance of that shift in voting intentions. Nevertheless, it is still a PC lead that would result in the Tories winning the most seats. Deciding whether the PCs are headed for a majority result based on Forum's numbers alone is basically a coin toss at this point. But the Poll Tracker uses the polling aggregate to make seat estimates — a necessity when the number of seats each party can win usually does not reflect their share of support among the population. The Liberals won 54 per cent of the seats up for grabs in 2014 — a majority government — with just under 39 per cent of the vote. In 1985, the PCs won more seats than the Liberals despite winning a smaller share of the popular vote. In 1975, the New Democrats finished second in seats but third in popular support. Seat projections are an inexact science, however. Human behaviour is not entirely predictable, and how votes will be distributed from one riding to the next can be difficult to determine using smaller-sample regional breakdowns of province-wide polls. But, taking into account their limitations, seat projections can offer a clue to how poll results translate into seats. That, in the end, is what decides elections. The PCs' support suggests they would be in a strong position to secure a majority government if an election were held today. The PCs are currently projected to win 84 seats, well above the 63-seat majority threshold. Andrea Horwath's NDP is projected to win 21 seats, just edging out the Liberals' 19. This is thanks to the PCs' double-digit leads in eastern and southwestern Ontario, and in the GTA-Hamilton-Niagara region. The New Democrats squeeze out the Liberals in seats due to their second-place showings in the north and southwest. The Liberals hold a narrow lead only in Toronto. But the seat ranges for the three parties are wide, indicating how many seats are currently in play as well as the uncertainty involved in making these sorts of projections. Majority, minority? And Liberals third? 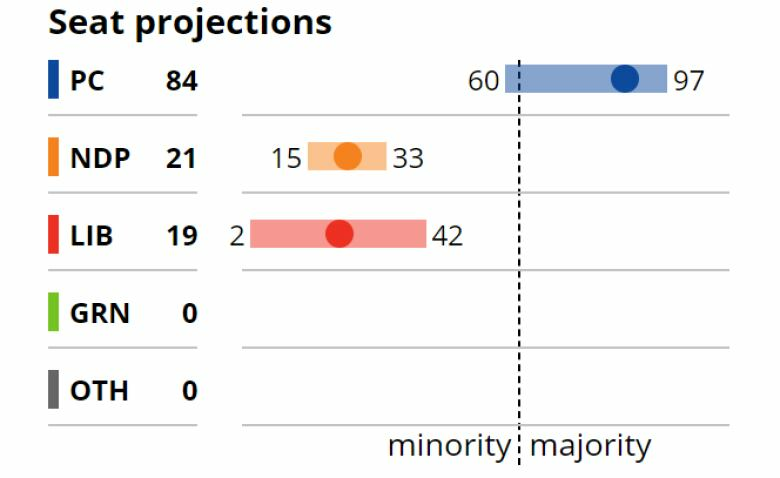 The PCs are projected to have enough support to win between 60 and 97 seats — that lower number putting them just below the majority threshold. The Poll Tracker estimates that there is only a five per cent chance that the PCs would win a plurality of seats — but not a majority — at their current levels of support. Their chances of winning a majority are far greater, at 90 per cent. Though the Liberals are projected to finish third in the seat count, they overlap a great deal with the NDP. The Liberals could win between two and 42 seats, with the NDP winning between 15 and 33. The Liberals have a higher ceiling and a lower floor because the New Democrats are in play in fewer seats. The NDP has fewer seats it is at risk of losing, but also fewer seats it is capable of flipping over to its side. The NDP's advantage over the Liberals is small — only 52 per cent of the time would they win more seats than the Liberals with these levels of support. But the Liberals' higher ceiling also gives them a better chance of beating the PCs. In just under five per cent of simulations, the Liberals would squeak by with the most seats; only very rarely do the New Democrats manage the feat. That is where the odds stand today. The PCs are in a commanding position, though the most recent poll suggests that position could be vulnerable. The Liberals have more upside than the New Democrats, but more downside as well. 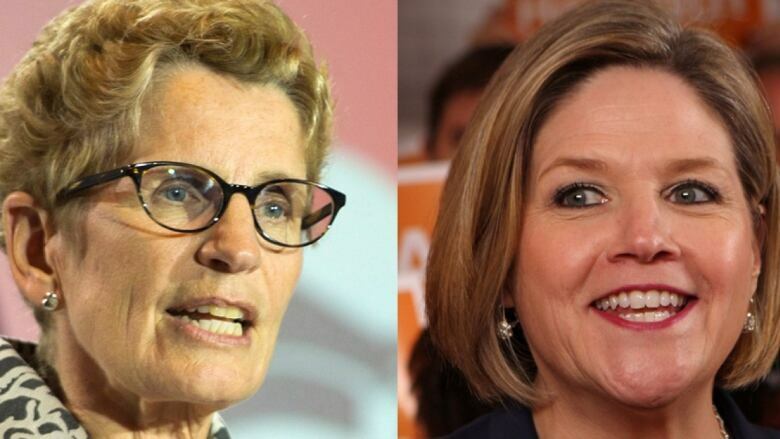 At this stage, Wynne's Liberals are more likely to finish first than the NDP. But they are also more likely to finish third. On the latest episode of the Pollcast, host Éric Grenier is joined by the CBC's Nick Gamache to discuss the new Ontario Poll Tracker. Then, the CBC's Peter Cowan breaks down the political situation in Newfoundland and Labrador as the province's two opposition parties choose new leaders. Listen to the podcast above, or subscribe to the Pollcast and browse previous episodes.